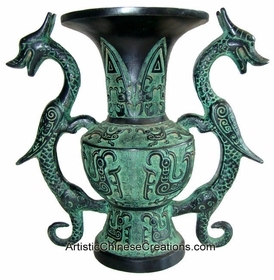 This brass vessel is a reproduction of the ancient Chinese bronze ware from SanXingDui. It is carved with ancient Taotie pattern. Made from copper/brass with a fine patina finish. SanXingDu is the name of an archaeological site in China, now believed to be the site of an ancient Chinese city. The previously unknown Bronze Age culture was re-discovered in 1987 when archaeologists excavated remarkable artifacts, that radiocarbon dating dated as being from the 12th-11th centuries BCE. Leaving behind nothing in the historical record, not even in myth, the unknown culture that produced these artifacts is now known as the Sanxingdui Culture. 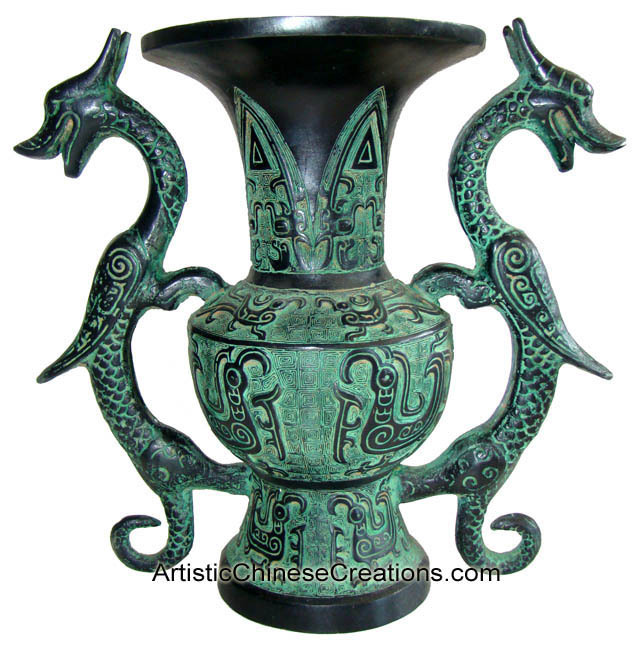 This ancient culture had remarkably advanced bronze casting technology which was acquired by adding lead to the usual combination of copper and tin creating a stronger substance that could create substantially larger and heavier objects. Please note: Currently, "Chinese Brassware - Twin Dragons #4" is available for shipment only in the United States. For customers outside of the US, please contact us for more information.